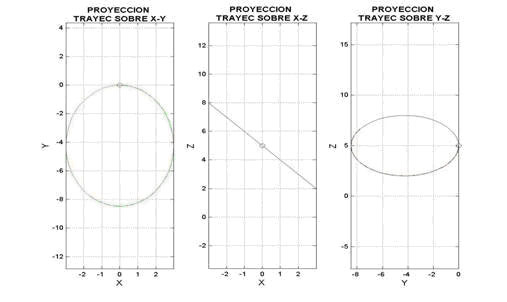 The hereunder shown results belong to four different simulations for the case of non-coincidence between the axle of the kinetic momentum of the body and the impacting external torque. 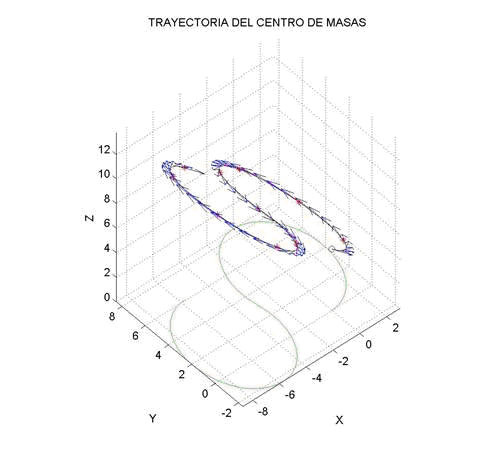 For each simulation we present one tri-dimensional graph of the trajectory of the mobile element and a second one with the orthographic projection on each of the coordinate planes. 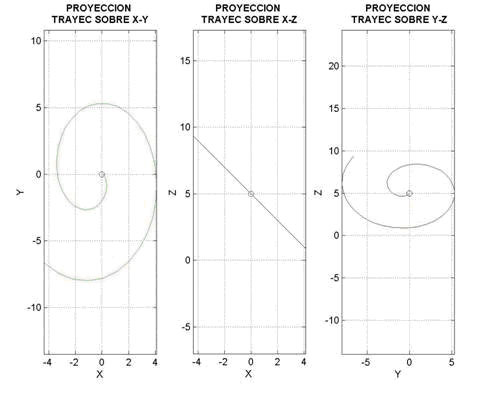 In all of the graphs, the symbol “o” indicates the starting point of the movement. 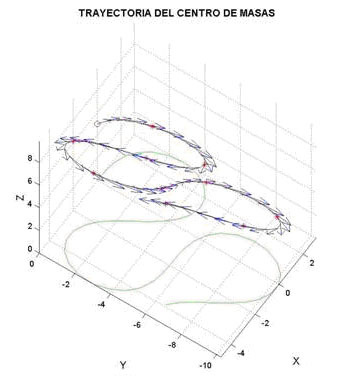 In the tri-dimensional graph, those positions of the mobile element which correspond to positions of whole time units (seconds) with the symbol “*”, and the tangential speed is drawn (in blue colour). 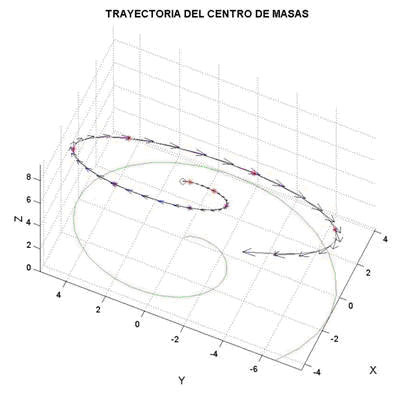 The employed reference system corresponds with a fixed reference (X,Y,Z), the origin of which coincides with the initial coordinates of the centre of gravity of the mobile, except for the coordinate z 0 of it, which has arbitrarily been considered as to have a value of 5 (for the sake of a clearer graphical representation). 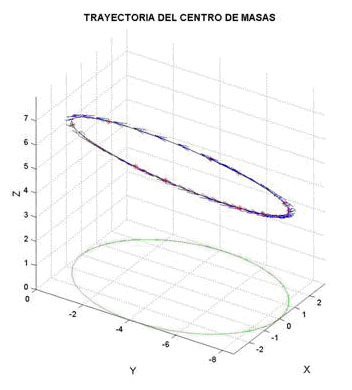 These simulations were carried out by Delfín Silió, Professor of the University of Cantabria. • Tangential speed 5 m/s. • Constant torque, always perpendicular to the tangential speed vector. • Torque is always perpendicular to the tangential speed vector, of constant module keeping one sense during the first 5 seconds and the contrary during the other 5 seconds. 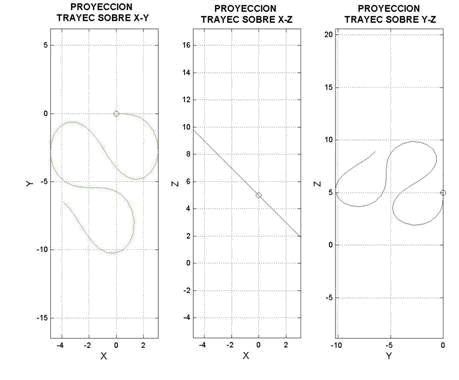 • Torque is always perpendicular to the tangential speed vector, varying according to the sinusoidal law of 2 m amplitude and period 2B seconds.